A poetry playground for the child in all of us. Click HERE to submit your poem to this month's DMC challenge! 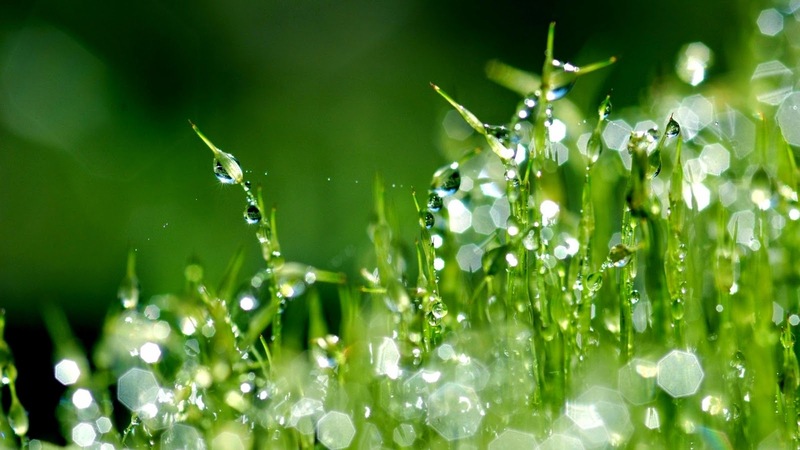 Photo: Tai, "Dew on Grass"
I found this wonderful quotation on the Poetry page of Violet Nesdoly's author website. I thought it speaks well to Violet, since she, herself, is the ultimate collector – of nature, art, moments, words.... She displays them in exquisite detail in her poems, her photography, and in the way she lives and values life. I'm honored to welcome her to the Haiku Garden. © 2011 Violet Nesdoly. All rights reserved. Violet sent me this gem with the following description: "I wrote this haiku in 2011, in a stretch of beautiful August days, each one beginning with a dew-drenched morning." I'm sure she joins me in wishing that everyone who reads this can enjoy a few days this month as magical as the ones that inspired today's little ditty. Photo: Jason Rogers, "Morning Dew"
And while we are gathered here in the Haiku Garden, I would be remiss if I didn't also share this link to one of my favorite posts on Violet's poetry blog– a series of haiku detailing the life cycle of a Magnolia blossom. 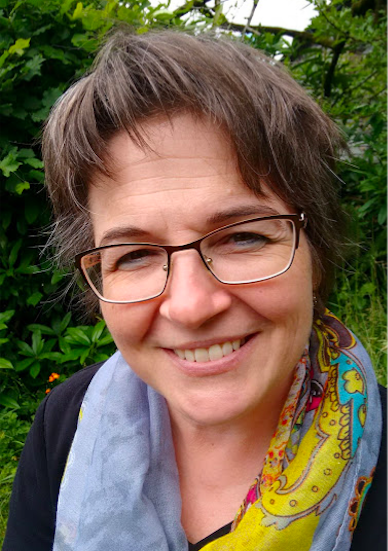 Besides writing poetry for both children and adults, Violet writes non-fiction, fiction, activities, book reviews, and devotionals. She also blogs... blogs, blogs, and blogs some more. For those who lost count, that's four blogs in total. In addition to her author blog and poetry blog which I've already mentioned, she maintains PROMPTINGS 2, a personal photoblog, and Other Food: daily devos, a source of daily devotions for adults. As someone who occasionally struggles to keep one blog afloat, I am astounded that Violet can keep up with them all! 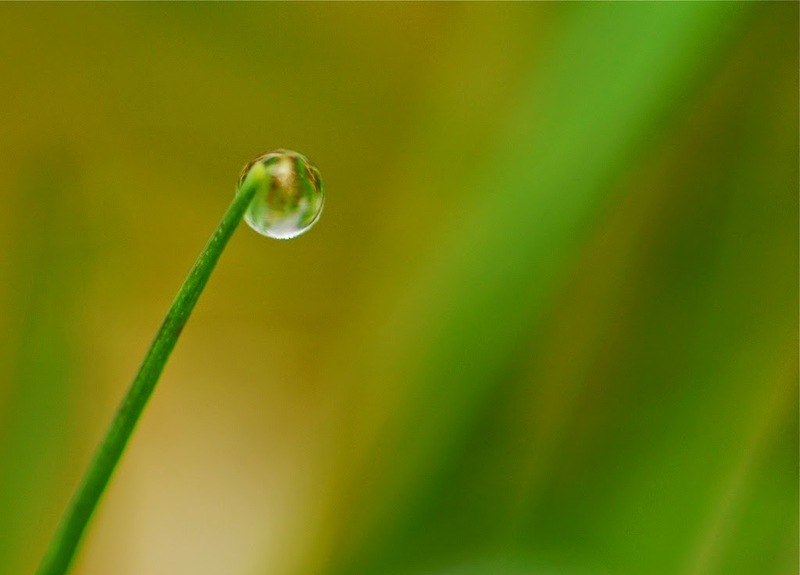 But that she does... and still she pauses, with her sack and pointed stick, to take in a dew drop on a blade of grass. in the Haiku Garden today! For those who missed last week's announcement of our August featured author, Lori Degman, and her fun new DMC challenge, you can find all the details HERE. 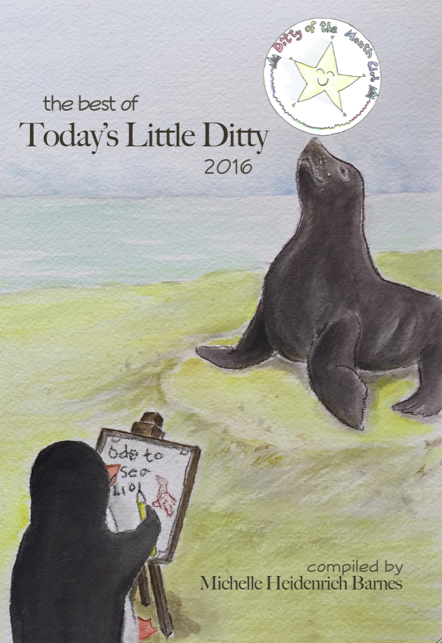 Today's Poetry Friday roundup is being hosted by Mary Lee at A Year of Reading. We can take a good lesson from Violet: no matter how busy life gets, stop and notice the beauty of the world! That's what I took from this beautiful haiku, too. Well said, Mary Lee. Great quote, and beautiful haiku! Glad you enjoyed the post, Matt. Michelle, you are so kind! Thanks for inviting me to be part of your garden and I just love the photos you chose to illustrate the haiku! (As for all those blogs, only one of them is a daily write because it's part of my personal spiritual practice. The rest are sporadic so I'm perhaps not as prolific a writer as you make out!) May you have a sparkling day! Sporadic or not, four blogs is still impressive to me, Violet. :) And yes, aren't those photos incredible? I was thrilled to find ones so complementary to your words! Thanks again for bringing your sparkle to TLD. I too, love the photos. The specificity of Violet's "one carat diamonds" is lovely! It's all in the details, isn't it? Violet's haiku is wonderful, and I love Tony Hillerman's quote. The next time I feel overwhelmed by my piles and files I'll think of his words. Thanks for sharing! Love that quote. Beautiful haiku and wow I had no idea Violet had so many blogs. Busy lady! Busy, indeed! Thanks for stopping by today, Catherine. I just came from Violet's other beautiful words about the flowers of summer, and now this, the gems of morning. Lovely inspiration from her, Michelle, and the photos are breathtaking too. "The gems of morning"-- love that! Michelle, thank you for a peek into your Haiku garden with Violet's pieces. I was struck by the clarity of the one carat diamonds' haiku that opened my eyes to the beauty of nature and the skill of being more observant. Violet makes being observant look easy, doesn't she? Great quote by Tony Hillerman. Thanks for sharing Violet's beautiful Haiku today! And thanks for stopping by to read and enjoy, Donna! Love the quote and the photos and the poetry. We could use some dew in the hot August mornings, but it's so dry here we don't even see much of that. Thanks for a day brightener. I think a road trip to Vancouver may be in order, Rosi! Thanks for sharing Violet's haiku--love those one carat diamonds winking! There's nothing like a little dew drop flirtation to brighten your morning, eh? I am impressed by Violet's productivity -- wow! You can feel the day's promise in those sparkling photos. 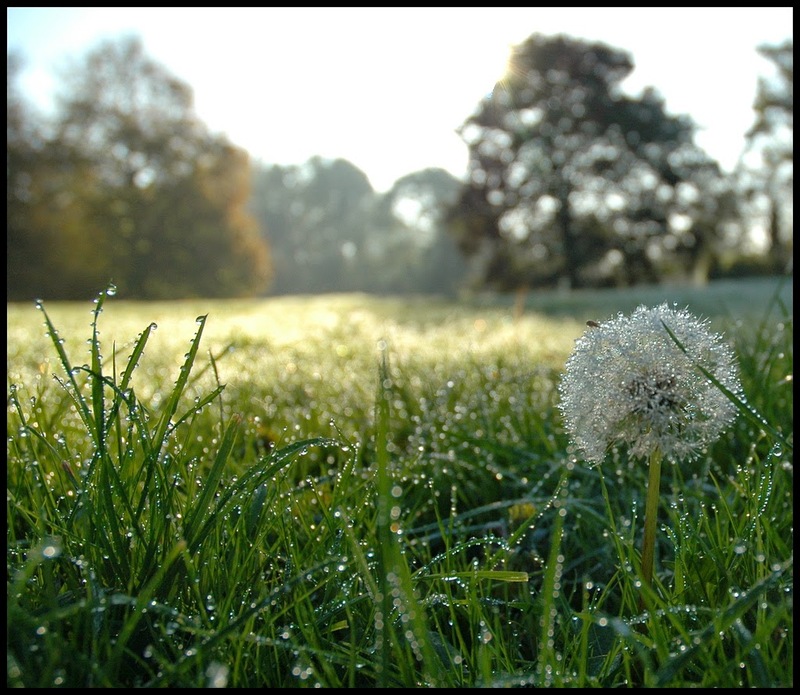 The amount of "dew photography" on Flikr is astonishing! I think I might have to write a poem about a spider web at dawn just so that I can use some of the dew-coated spider web photos I found. I agree, early morning perfume is amazing! So fresh and lovely, crisp and clean. Thank you for sharing Violet's sparkling haiku. The magnolia haiku are wonderful word pictures to accompany the photos, too. Aren't they beautiful? Violet is certainly a multi-talented artist. I couldn't agree more, Bridget. Violet's talent is inspiring. The following poet/authors contribute educational posts to Today's Little Ditty. Please click on their names to explore their series. 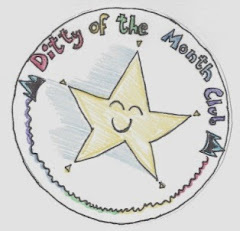 Submit your poem for the current month's challenge by clicking on the link at the top of the page. Click on the DMC star (above) for links to past challenges. 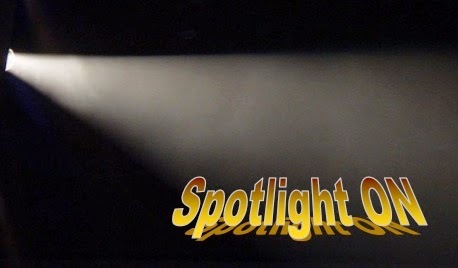 Click "Spotlight ON Interviews" (below) for a complete list of interviews to date. Click on covers to purchase. 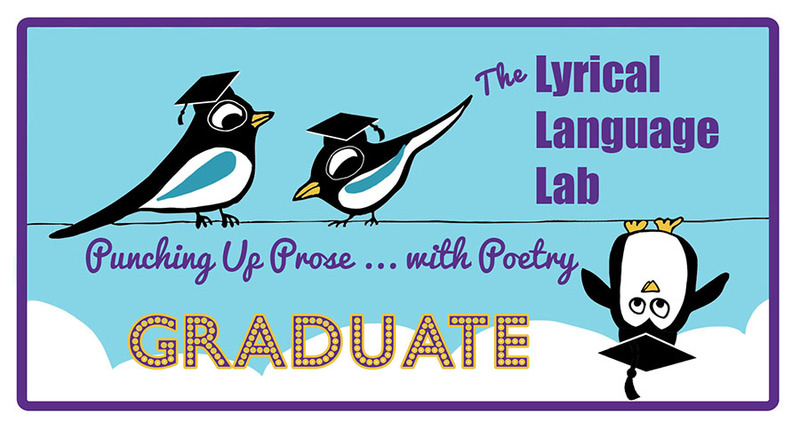 Click on the image above for blog posts with practical advice about bringing poetry into the classroom. Click on "Teacher Tips" for a downloadable/printable document. 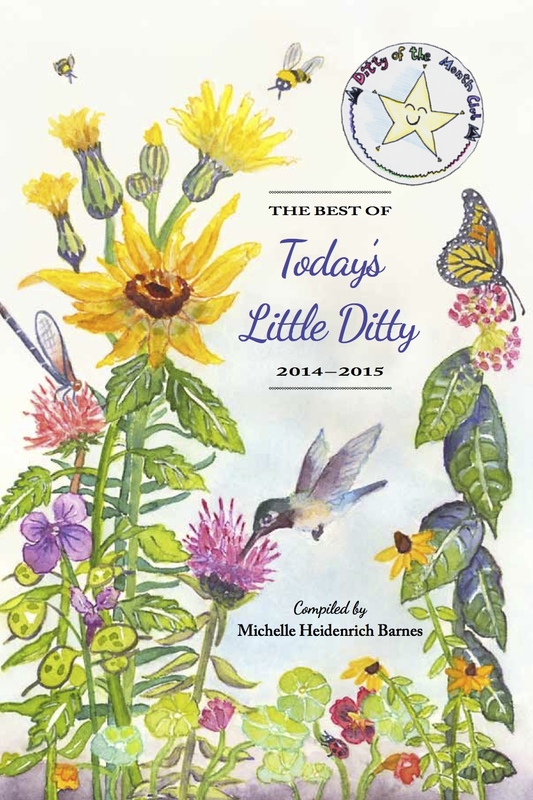 Great for National Poetry Month or any time of year! Visit Michelle Heidenrich's profile on Pinterest. 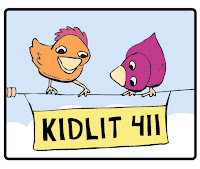 In accordance with the Children's Online Privacy and Protection Act (COPPA), Today's Little Ditty does not seek personal information of children under age 13. If a child under age 13 chooses to comment on a post or otherwise participate on this blog (by submitting a poem, for example), he or she must do so via a parent or with written parental consent. Comments or poems submitted by children under 13 without parental consent will be deleted. © 2013-2016 Michelle Heidenrich Barnes. All rights reserved. Watermark theme. Powered by Blogger.